Hiru TV, Hiru FM and Hiru News bagged all the main awards at the World Social Media Day held in Colombo yesterday. While Hiru News won the award as the Most Popular News Provider, Hiru FM and Hiru TV won the awards as the Most Popular Radio and Most Popular TV respectively. ‘Mashable’, the world’s biggest news website that reports news about digital culture, social media and technology celebrates June 30th as the social media day every year. 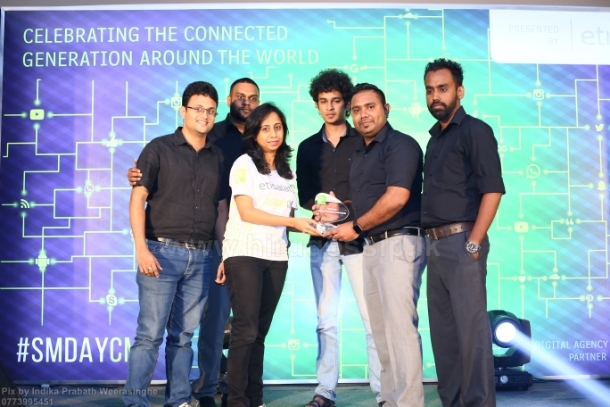 'The Social Media Day' was hosted for the fifth time in Sri Lanka and was presented by Etisalat in association with Neo@Ogilvy. The awards were presented under several categories on the basis of the popularity in social media prevalent in Sri Lanka. On this occasion Hiru won the most prominent awards namely the award as the most popular news provider and as the most popular radio and the most popular TV while being felicitated as the media network that has won the attraction of listeners across the island. It is significant that the winners in this were selected by holding an online poll. It was further confirmed through this that millions of people constantly use all the websites of the Asia Broadcasting Corporation including Hiru News Website run by Lotus Technologies (Private) Limited, the digital media company affiliated to the Asia Broadcasting Corporation that possesses the ownership of a number of the country’s top websites. Lotus Technologies is now Sri Lanka's number one and the largest digital media network. The prime force behind these awards that Hiru TV and Hiru FM won, is the chairman of Asia Broadcasting Corporation Mr. Rayynor Silva. Hiru TV and Hiru FM channels that began under his concept have by now brought the art of media to a new arena under his guidance. Expressing his best wishes with regards to Hiru News, Hiru FM and Hiru TV winning awards at the ceremony held in Sri Lanka in view of the world social media day Asia Broadcasting Corporation Chairman Mr. Rayynor Silva said the people of the country had repeatedly corroborated his vision of raising Sri Lanka’s Art of Media on a new path. He said that awards like this which are presented nationally and internationally on Hiru News, Hiru Fm and Hiru TV were definitely an encouragement.